Omelette. It sounds kind of funny if you say it over and over again (I tend to do so with certain words until they sound all strange and dumb. Great hobby.). In Swedish you supposed to say "omelette!" the way you say 'cheese' with a grin when you're having your photo taken. Or at least what you said when I was a kid - maybe you say "usb" or so nowadays, I have no idea. Well, either way; I do an omelette quite often as it is fast to make, tastes good and is pretty much something you can make out of anything! Well as long as you have eggs at home. But anyway, back to that special great omelette of mine!. -Some spices and fresh herbs, if available. Other ingredients like mushrooms and spinach go really well here too, but I had none today. Mix the eggs with some spices; I use white and black pepper and a bit of Cajun spice blend. 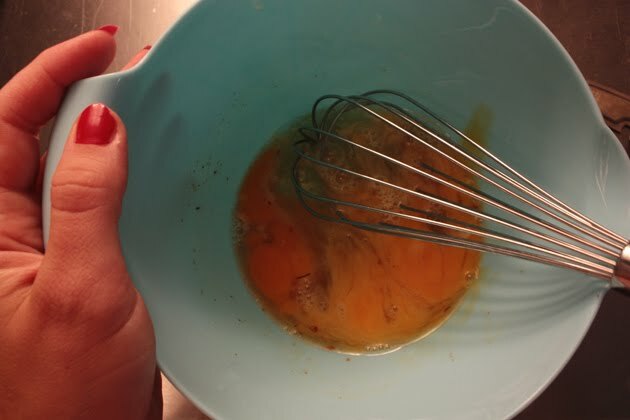 You can also put some garlic in the batter and add a drop of milk or water if you prefer. Pour the batter in a pre-heated pan and start frying. (Duh...) Meanwhile slice the cherry tomatoes in half (or chop the regular ones). 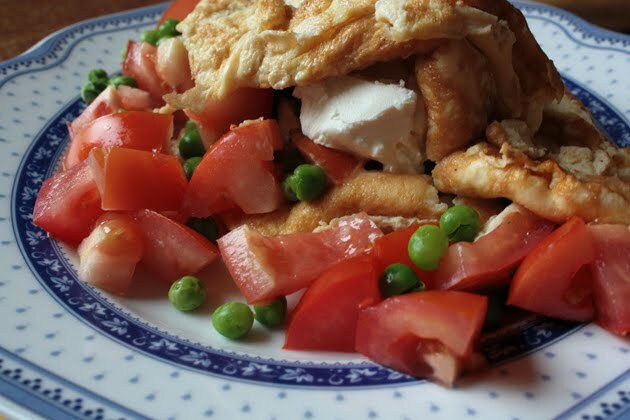 If you want to use other vegetables you can mix them in the egg batter qnd fry or warm them up separately. 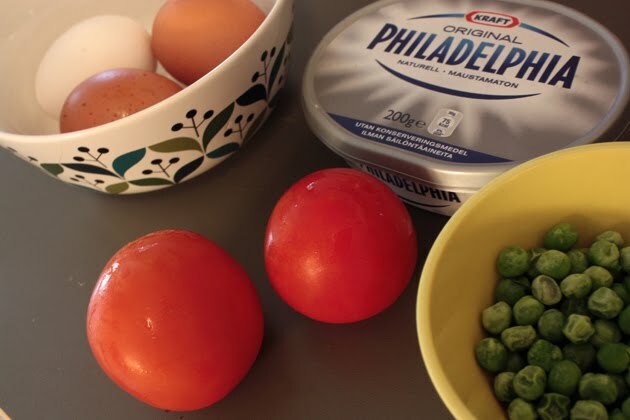 I often mix spinach in the batter for a green omelette, or warm some up in the micro wave with the peas and mix together with the cream cheese to a green thick sauce. 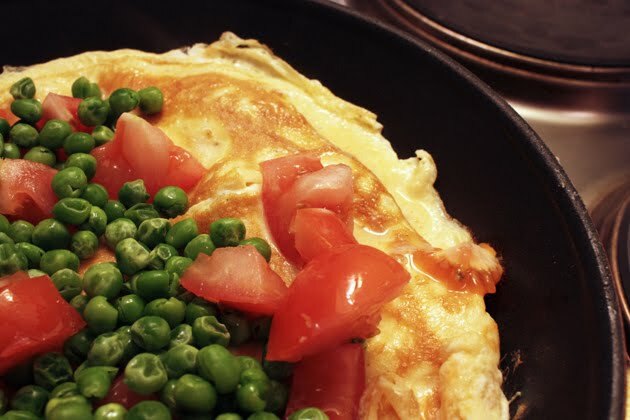 Sometimes I flip the omelette over and fry it on both sides, other times I just leave the top soft and let the vegetables sink in.You can also shake the omelette like the pro's do here for example. How you do it is really up yours, as Matti Nyk�nen, Finnish national hero, would say . Either way, just before the omelette starts feeling ready you pour the vegetables on the omelette in the pan. I want them to remain rather fresh; you don't have to cook them for long. 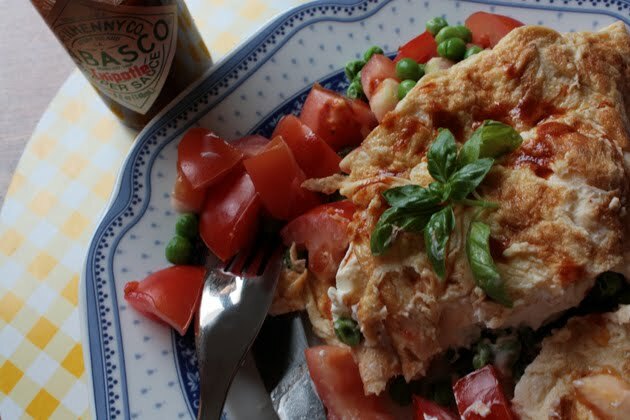 Scoop a lot of cream cheese on to the omelette, add some fresh herbs if you had any and then flip it over like a calzone and carefully put it on a plate. You're pretty much done by now but for the real cherry on top, or in this case: Chipotle on top, you do just that; sprinkle some Chipotle sauce all over it. It really crowns the whole thing!